An unexpected visit to the Emergency Department (ED) invariably raises many anxious questions for any patient: What’s my diagnosis? Am I safe to go home? How can I prevent returning to the ED? Meanwhile, ED health professionals want to communicate better with patients and family to ease discomfort and anxiety, yet have limited time with each patient. Dr. Kendall Ho’s team proposes to develop an app that enhances patient-health professional communication to dramatically transform the patient experience in the ED. The app will gather and organize information to provide patients with their diagnosis, treatment and discharge instructions, and facilitate follow ups. It will also track real-time ED patient volume and speed of flow to anticipate wait times and avoid overcrowding in our hospitals. Building on the work of Dr. Ho’s team to date in supporting patients with heart failure transitioning between ED, hospital and home, this new app can further solve a global health challenge to improve patients’ understanding of their diseases, shorten their ED length of stay and decrease unnecessary ED revisits. Dr. Ho is a Professor at the Department of Emergency Medicine in the University of British Columbia (UBC) Faculty of Medicine, a practicing emergency medicine physician at Vancouver General Hospital (VGH), and leads research in Digital Emergency Medicine — the use of innovative technologies to improve patient care in this domain. 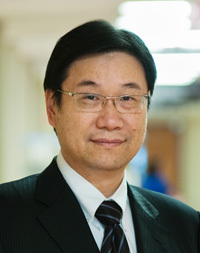 Dr. Ho was the founding Director of the eHealth Strategy Office from 2008 to 2015, and past Associate Dean of the Division of Continuing Professional Development and Knowledge Translation (CPD/KT) from 1998 to 2008. He has been involved in developing eHealth curriculum at the UBC Faculty of Medicine and nationally at the Association of Faculties of Medicine of Canada, and the Royal College of Physicians and Surgeons of Canada. He is a collaborator in eHealth with the World Health Organization and the Pan American Health Organization.